We scored a great deal on some chicken breasts the other week, and they have been languishing in the freezer ever since. I decided last night that it would be a good time to use them up. 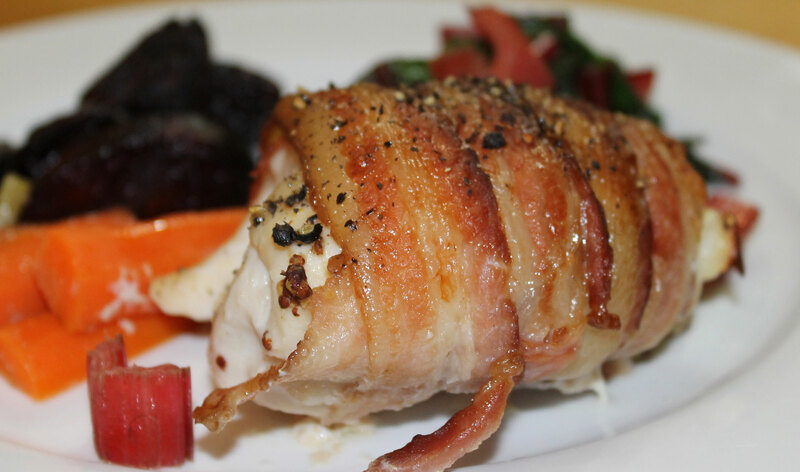 Because boneless, skinless chicken breasts are often dry and tasteless when cooked (there is very little fat in them, and fat = moistness and flavour), I decided that I would wrap them in bacon. OMG these were to DIE FOR! Totally delicious. The bacon crisped up wonderfully and contributed a lot of flavour to the dish. They were also very quick to cook as well. This recipe is a stage 1 AIP reintroduction recipe that calls for black pepper. If you have not managed to successfully reintroduce black pepper, or you are still on the elimination phase of AIP you can simply omit the pepper. 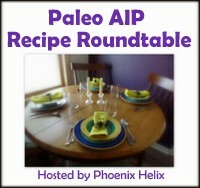 When reintroducing foods on the AIP, I recommend this guide. This is such a simple recipe! While the oven is heating, season the chicken breasts well with the poultry seasoning. Wrap each chicken breast in 2 rashers of bacon. Place them in a roasting tin and season with sea salt and black pepper – you probably won’t need to use much salt if your bacon is salty. But the pepper really helps the flavour. Bake in the oven for 30-35 minutes until the bacon is crispy and the chicken has reached an internal temperature of 82°C/180°F. Remove from the oven and leave to rest for 5 minutes while preparing the sides. 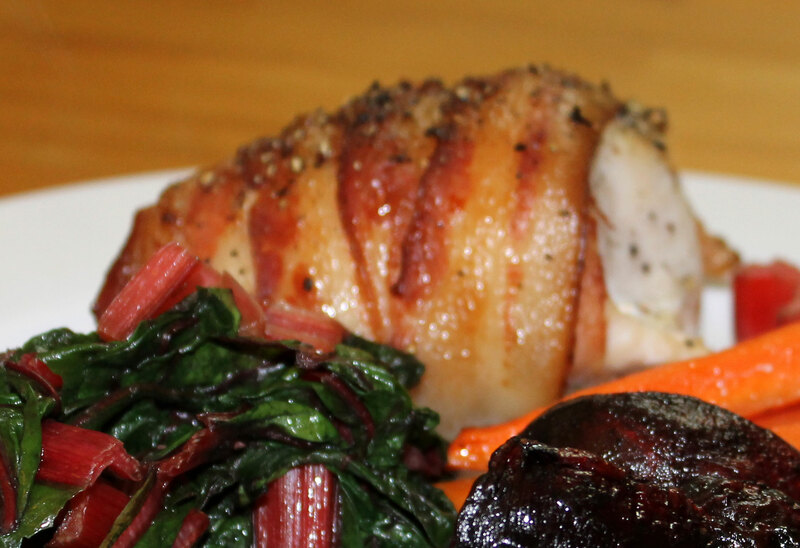 I served this with some sauteed ruby chard and oven-roasted carrot and beet fries. This entry was posted in Autoimmune Protocol Foods, Recipes, Stage 1 Reintroduction and tagged AIP freindly, dairy-free, gluten-free, grain-free, paleo, primal, quick. Bookmark the permalink. 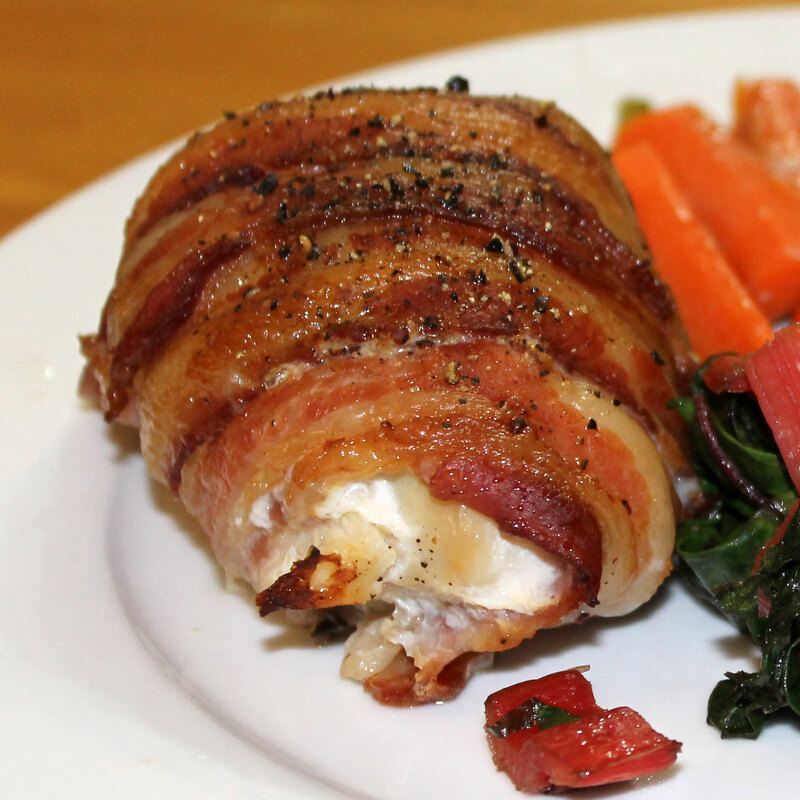 I love the ease of this recipe…and bacon makes everything better! featuring your recipe this week! Hi Charlotte. I chose this recipe as one of my favorites to feature at this weeks AIP recipe roundtable. Thanks so much for linking up! One of my favorite T shirts says “everything goes better with bacon”. That for sure includes boring white meat chicken. 🙂 Thanks for sharing this. I’m planning to make this later this week. Quick question: my bacon is thick-cut. Do you know if that will affect the recipe at all? I hope you enjoy it. I don’t think thick-cut bacon would affect the recipe too much beyond giving you more bacon… It might take a bit longer to cook and crisp up though. I made them tonight and just cooked them an extra 5 minutes. Yummy! Definitely a new favorite recipe. I love this idea, thanks for sharing on Real Food Fridays, join us again tonight.